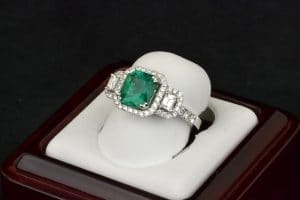 Tradition has long dictated that a man is supposed to choose an engagement ring for his girlfriend and surprise her with it, but these days many people buck that tradition. It’s becoming much more common for couples to come into Copeland Jewelers and pick out an ATX engagement ring together. Some people, however, still prefer the surprise method. Truly, there’s no right or wrong way to approach this very big decision; what matters is what feels right to you and your partner. Here are some pros and cons to consider before a ring is bought or a question is popped. When you shop together, you can be certain that the partner receiving the engagement ring is going to get a style they like, since you can discuss shape, cut, color, and gemstones together. An engagement ring is often quite expensive, so shopping for rings together can be essential for couples who have combined their finances. Think of this as the first in a long line of financial decisions you’ll have to make together once you’re married. Shopping together can take a lot of pressure off the partner giving the ring, who may be nervous about making style or financial decisions without their other half. Many women feel uncomfortable with older notions of “ownership” that sometimes go along with marriage and engagement rings, so if your partner is a woman, allowing her agency in the decision over her own ring can give her empowerment and reinforce the equality in your partnership with her. Choosing this important symbol of your commitment together can be a wonderful bonding experience and actually strengthen your relationship. Some people feel that a proposal is less romantic when they already know what the ring will look like, or when they know their partner has purchased a ring and it’s just a matter of waiting for the proposal to happen, or to receive a proposal without having a ring present. Some couples actually operate better when they make certain financial decisions separately. It can be awkward to go ring shopping together and discover that one partner has their heart set on a ring that’s way out of the other’s price range. Or the partner receiving the ring may worry that it cost too much money, which may take away from their enjoyment of their own ring and engagement. It can be really wonderful to know that your partner took the time to observe your jewelry tastes and get input from your family before picking out the perfect ring just for you! Every couple is different, and every engagement is different. Your Austin jewelry store, Copeland Jewelers, understands this, and we’re happy to meet your needs, whatever they are. If you and your partner want to come in and choose an engagement ring together, that’s fantastic! If the two of you want to come in to do a little “window shopping” – try on a few rings, see different designs, and get a sense of style and pricing together – and then have one partner choose a ring later in secret, that’s wonderful too! And if you’re a true traditionalist and want to pick out a ring completely solo, we’re more than happy to provide advice and guidance along the way!